Other than being grateful for what you already have in your life to attract more abundance, what else can you do? First, ask yourself what type of abundance you wish to create. Do you wish to have more love? Do you wish to have more creativity? Do you wish to have more free time? Do you wish to have more calmness? 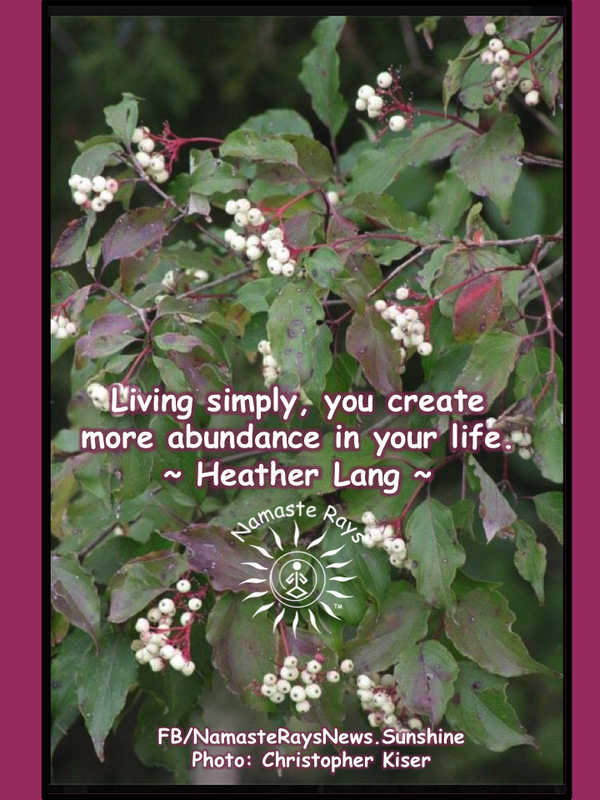 Living simply, you create more abundance in your life. I’ve learned the more simply you live, the more abundance you can have in all these areas. Being more loving, creates more love, for instance. If you wish to have more tranquility in your life, remove the drama in your life. Drama creates havoc and stress, which are the opposites of tranquility. Just because others in your life are creating drama does not mean you have to join in the program. Listen, breathe, and realize drama simply accomplishes nothing. Drama is also complaining. What does complaining actually do? It’s non-active. Do something active about the situation. This creates more abundance in your life because you are now utilizing your time more effectively. Using our time more effectively is living simply. Less drama is simpler than more drama. Remember to ask yourself in drama situations “How important is it…..” and fill in the blank. How important is it to participate in the drama? Or perhaps the gossip? Live a more simple life and opt out of the drama. Another way to create more abundance is to stop living in the past, especially when the past is causing the guilt and shame to stay with you. This is excess baggage you simply do not need. Work on figuring out why you feel the need to continually feel guilty about something. Once you have…drop the guilt and fix it if you can. Sometimes the only way to fix it is to ask for forgiveness from yourself. When we are carrying less baggage around like shame & guilt, we feel lighter. Isn’t being lighter more freeing? Isn’t being lighter simpler than carrying tons of baggage? We all want to have “more time” as well. What can you stop to create more time? How can you create more abundance of time in your day? Get up an hour earlier? Ask for help from the family on the household duties? Make an action plan and stick to it? Schedule time with family & friends? Schedule time for yourself? Learn how to say “no”? We don’t have to be superwomen & supermen. We simply do not. How important is it? Living a more simple life includes taking actions to obtain more abundance. Living a more simple life includes taking physical, mental, emotional and spiritual actions towards obtaining more abundance. Opt out of the drama. Drop the baggage. Gossip less. And then…forgive more; love more; be more kind, compassionate and understanding. When we are in a positive state of mind with love, kindness, compassion and understanding, the abundance which flows back to us is astounding. When we realize how we are spending our time, we can change our frame of mind, our schedule and our whole Being to move towards the abundance we truly want. May you create more abundance in your life by living simply.